IFBC 2013 - International Food Bloggers Conference 2013, here I come! It's hard for me to grasp that one week ago, we arrived home from New Orleans. In two days, I leave for NYC. Two weeks later, I leave for Seattle. My suitcase has not made its way back to storage since returning back from NOLA. 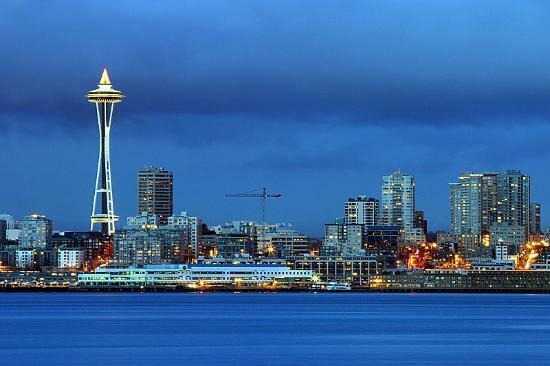 This will be my first trip to Seattle, a place I have wanted to visit for longer than I can remember. While I was a huge fan of the Twilight series, it has nothing to do with that - or Starbucks. It goes back to the early 90s, days when I used to sneak my fathers flannel shirts out of the house in my Jansport Backpack. Wearing really dark eye makeup and doc martins, being angry at the world because they just didn't understand who I was. If you know me today, I'm sure it's is hard to imagine this prepster as that grunge girl. But I have embarrassing photos to prove this stage of my life. I will always hold a special place in my heart to Eddie Vedder and Kurt Cobain. So why am I going to Seattle? I'm attending the 2013 International Food Bloggers Conference. aka IFBC! I am not making this trip across the country alone, 7 other Tampa friends and food bloggers, Leslie, Rachel, Jennifer, Blaire, Tracy, Raubi, & Kerry will also be in attendance. Four full days of food, wine and learning how to become a better blogger, in a city made for foodies. Put on by Foodista and Zephyr Adventures, our 4 days are action packed. In 2012, I attended Blogher NY. I learned quite a bit as I just re-entered the crazy world of blogging 2 months prior to attending. Although I have been blogging since 2008, I took a year off and during those 12 months - all hell broke loose. "Bloggers" became a household name and some became celebrities with talk shows. Opportunities jumped out from anywhere you looked. I was like a kid in a candy store with no direction. BlogHer was my first conference and I learned a lot from it. Here are the top tips I learned from attending that conference, which are great for first time conference attendees at IFBC 2013, Seattle. 1. REMEMBER WHAT YOU ARE THERE FOR: At BlogHer, there were about 10-20 private parties held daily/nightly by major corporations trying to impress Bloggers. I accepted every single invitation I received and was exhausted. Do not overextend your schedule. Remember what you are there for and be sure to save a few windows for "me time". 2. SCHEDULING: Go through the conference schedule and be sure to attend the sessions which fits your blog the most or sessions you need the most assistance in. If you are attending with a friend, it is smartest to attend different breakout sessions so you get the most out of the conference. 3. BUSINESS CARDS: This is very important. Bring at least 250 and make sure they represent who you are and stand out. I saw everything from girls handing out business cards on chapstick to girls having their names on a Hershey bar. While this is memorable, it is not necessary. Just order really good quality cards and be sure to have all of your current social handles and correct email on them (no brainier, but you'd be astonished how many people hand wrote in "new" email addresses). 4. LABELS: Print out labels with all your name, address and social handles on it. This way, you will not have to spend time hand writing information on sheets. 5. SHOES: Most ladies stress over what shoes to wear to a conference. I purchased multiple pairs of "cute shoes" to wear to BlogHer and regretted every moment of it. You will be on your feet a lot. I am bringing my most comfortable boots, which I can stand in all day and planning my outfits around them. 6. BUSINESS CARD HOLDER: The SMARTEST thing to bring is a miniature hole puncher & carry a large key ring. As soon as you receive a business card, punch it and place it on the ring, as seen below from the pixelista. You will not loose an important contact. Also bring a sharpie and write on the back of the card, in case you need to remember someone you meet. 7. DON'T OVER INDULGE: Food and drink will be everywhere. Know your limitations going into it. You do not want oversleep and miss our keynote speaker, Dorie Greenspan! In NY, I nearly missed Martha Stewart because I was very very very sick (real flu - not the Irish flu). I missed an opportunity to meet Martha and my blog idol, Ree Drummond. I got sick inside of Radio City Music Hall and lost out on the chance to dance with the Rockettes. OK - off my soapbox. Just don't go overboard on the free booze and use hand sanitizer! 9. SWAG: Last but certainly not least - bring a second bag to bring the swag home in. I gave away so much stuff at BlogHer that I couldn't fit in my suitcase. This trip, I know better and will be bringing a large canvas bag which easily folds up in my suitcase. Keep in mind, if you receive food products, you will not be able to carry them on and they will need to go in your check in luggage (same with knives, dont try to carry those on!). While this post is from 2009, you can see the amount of serious Swag one can receive from a conference of this caliber. Via Foodonthebrain.net - Serious Swag 2009 IFBC. I am so excited for IFBC. Sponsored by Urbanspoon, Amazon.com, Yelp, AllRecipes.com, and many more. 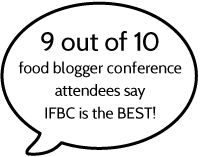 IFBC is seriously regarded as a prime blogger conference and 9 out of 10 food bloggers say IFBC is the best. I am not sure what I am looking forward most to but I do know I will be returning home with a coffee mug from the original Starbucks! Brilliant post! That biz card ring idea is gold! Thank you for this! This will be my first non-work conference and I appreciate all your advice. Looking forward to seeing you there! Social Fresh was my first conference ever and I feel like it did not at all represent the kind of conference we are going to in Seattle. I have a number of business cards, but guess what? When I ordered, I didn't put my email on them. EPIC FAIL. I'll be the one writing my email address :( (Also b/c I'm cheap and don't want to reorder.) Anyway, did not realize about all of the swag. I'll be bringing an extra bag for sure!